I used a bag yesterday that's been hanging on the banisters for the last week or so. It's a small enough bag, a brown leather satchel but it's one that's in constant rotation. Half way through the day I reached in to pull out my lippie from the back pocket that I'd thrown in before I left the house. (Clarins Rouge Prodige in Fig)(My HG lippie that goes everywhere with me). By any accounts this is excessive, right? So how about you make me feel a little better, what are you lugging around in your mála right now? Don't think about it just look and lemme know! of products in my main bag. I ought to be ashamed. Truly. Oh I'm not too bad for once! I don't think... hang on..
Garnier Intensive 7 days hand cream, Sinex, Rescue Remedy, EOS lip sphere in mint, Essence perfume (the spring one), sample spray of Dior Addict, Lacura mascara that I bought after forgetting to put mascara on that morning (how?! ), vaseline lip therapy, body shop lip balm, Catrice Colour Show lip gloss in lavender (?! ), Essence lipgloss in toffee, Clarins lipgloss thing in 04, Too Faced lip injection in techno glow, and Helena Rubenstein wanted shine lipstick in some browny colour (label gone). Hmm. Oh my ... just checked mine only to find the following ... Wallet, Kindle, 2 notebooks, 3 phones (!) 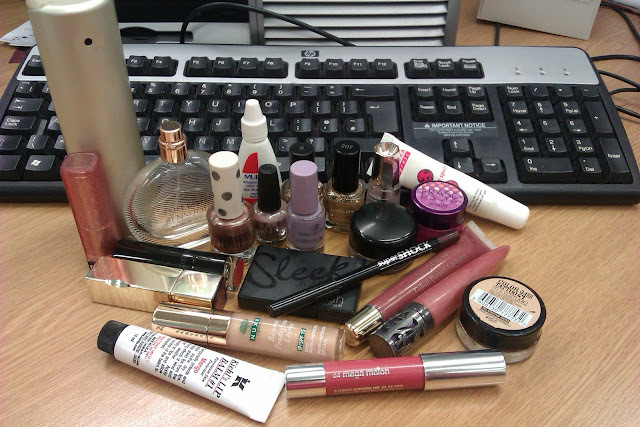 Pad of post it notes, 2 pens, small makeup bag (blusher, mascara, brushes, highlighter) 2 nail polishes, body shop perfume, Hand Maid hand gel, small Hand Food hand cream, cup a soup, blister plasters, paracetamols, 2 nail files, cuticle oil, Zara roller ball perfume, smints, 3 hair bobbles, Loreal True Match mineral foundation, phone charger and headphones, car keys, house keys and 'lady items' ... dear lord, its no wonder my shoulder hurts! ohhh, i feel for you!!! i guess i can slowly remove sun cream and definitely apivita express creams??!! !